Chinks #460 were created to match this customer's beautifully tooled saddle, including a dragonfly with special meaning on her back belt, and a pair of chocolate brown and bone white boots she wears for Working Equitation shows. We had never done this color combination before, and absolutely love how well it worked! These had extra long 12" double fringe, and lots and lots of spots to make them pop on her beautiful multi colored horses. Out West Saddlery shared a post. Been on the go a lot here in New Zealand......finally getting a little down time to work on sharing more New Zealand photos. These were a really fun and extraordinary pair to make. Double twisted black and brown fringe, spots on every scallop, Elko style hardware, and vines for days! Here is saddle #102 made for Karen Weibel in New Zealand as a gift for her and her incredible Kiger Mustangs imported to New Zealand in 2018! We wanted them to have a great start with a well fitting saddle and one that will sit Karen properly. The saddle is on a wade style tree with a half seat and old time drop point square skirts. Out West Saddlery shared a photo. This is what Shane Post had to say about his new custom 3B Visalia Saddle!! "Just had the first ride in my saddle can’t tell you how happy I am with it. My horses are also very happy with it I finally have a saddle that fits my horses and they move so much easier now I can’t tell you and Bob thanks enough!!" 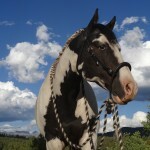 For your horses personalized program call Terri at 970-264-2524. "I just wanted to share how much I’m enjoying the chaps you made for me. When weather warms up I’ll be switching to the chinks you made for me. You do amazing work." My Dilly mule begging for her morning herbs on this snowy morning! She loves how good they make her feel at 24 years old! Cracker comes running for his Equine Natural Care herbs every morning and evening. He feels so good!! As it says below: If you need, shake off 2018 because 2019 is gonna be rockin! We at Out West Saddlery hope 2019 is your best year ever!! All of us at Out West Saddlery wish you and your family a very Merry Christmas and a Happy New Year! Thank you all for being apart of our wonderful facebook community! This is what Lisa Jansen had to say about her experience working with myself and the amazing herbs from Equine Natural Care! Jewel is one lucky horse to have Lisa as her partner willing to give her the best possible care! This is my passion! I would love the chance to help you have a balanced horse/mule mentally, emotionally and physically for the best possible experience for you both. I do all my evaluations from a distance using a picture and kinesiology so I can work with any horse from anywhere in the world and I do.
" So glad I found you, Terri! Out West Saddlery, and Equine Natural Care herbs are so amazing! I feel so confident feeding these herbs to my horses with the feedback that I receive from Terri with the energetic evaluation. She is always spot on with what my horses need, and the results have been fabulous. They are the only horses at the barn that I board at, that have clear bright eyes with no eye “boogies”. Earlier this summer my mare had swelling under her belly, and down the back legs, my vet said sometimes it is normal with the hot weather. My mare was so uncomfortable. I called Terri, to do an evaluation and she sent herbs, and within a week the swelling was much much less, and in two weeks, it was nearly gone. These herbs are Amazing! And I’m now using them on my dogs too!" Out West Saddlery is with Jayne O'Brien Myrick. You know what would be an awesome gift? This beautiful pair of brown ranch and pleasure chinks! Something to melt your heart at this special time of giving. What this horse gives is priceless!! This is so beautiful!!! I wonder how many other horses have this gift and just need a chance to try it? Bet there are a lot! So many people could benefit everywhere! Amazed and thrilled these facilities allowed him inside! The season of gifting is nearly upon us! To help with your shopping, we have created a page full of discontinued bargain items that might be perfect for your loved one! Browse the page to find singular items up to 50% off that will no longer be available once they are sold! New Lower Prices on our awesome Pioneer Shirts! These are the most comfortable riding shirts and they wear like iron made out of pima cotton. Christmas is coming! We are working on a Bargain/Close Out Page we hope to have up on our website soon to help with your Christmas shopping needs! We are having some serious internet issues which is slowing our progress but stay tuned and give us a call if you have any questions in the meantime at 970-264-2524. Out West Saddlery shared a video. Chaps #267 were made for a lovely young lady who plans to use them for reining competitions in Europe! NEW WILD RAGS!! These extraordinarily unique and beautiful wild rags are designed to share Buck Brannaman's wisdom through his own words while capturing the visual texture and richness of the Vaquero lifestyle. *Pictures don't do the colors justice!! There are 3 different colors. Each color we have tied 3 ways so you can see the variety you get out of one scarf! Features: Over 40 of Buck Brannaman's quotes addressing life and horses, Buck's brand, Buck's image, Buck's signature, Hand-rolled edges, High quality 12 weight 100% silk charmeuse, Generous Vaquero style 42" square, $75.00 each. These beauties are really pretty to look at as the 120+ spots and shiny JW conchos catch the light! They have bling without being pretentious, and will look good in the arena or on the trail. The rust hide is midweight and stands out against the dark yokes nicely. They have 6" fringe and are ready to be fit an finished to you! Proud Mom Kathy Baar shared this with us! We had so much fun making these chinks for Luke. He actually designed them, he knew what he did and did not want! Need some sunshine? These bright yellow sunflower chinks will transport you right out among the wildflowers. The delicate floral tooling and coloring on the yokes, and the addition of the new JW Sunflower bronze conchos really ties them together. These are special chinks for a special person. They have 8 3/4" fringe, and ready to be fit and finished to you. This was one of the most fun and unique projects we have ever done. A surprise present from 3 siblings for their mom, who is an avid birdwatcher. This binocular case is completely one of a kind, and is all hand painted with the recipient's 5 favorite birds. These are a gorgeous moss green with serpentine border stamping and an oak and acorn embellishment. They feature the beautiful new JW bronze vine conchos and buckle, and are ready to be fit and finished to you! 8 3/4" long fringe, and a longer side yoke. These will be best for someone taller than shorter. These simple, rustic chinks are made of a durable oil tan hide that is very water resistant. They have double barbwire tooling, beautiful "In Christ" brass conchos, a laced adjustable back belt, a simple centerbar front buckle, and 6" fringe. These are a great heavy duty working pair that you will get many years out of! These are best suited to someone under 5'7" and are ready to be fit and finished to you! Celtic themed black chinks with copper accents and hardware! Just a gorgeous combination that will really stand out. These have 8 3/4" fringe and longer yokes, so would be best suited to a taller person. Ready to be fit and finished to you! These are a truly exquisite set of chinks. The hide is a new one for us, with a super rich buttery texture, and even a tiny bit of darker marbling in the brown that is hard to see in the photos. They have solid bronze peony flower conchos and buckle, and matching dimensional framed floral tooling. Understated and simply stunning. These will look good on anyone! Ready to be fit and finished to your measurements. Our wonderful Canadian customer David Busuttil shared his reaction to the custom saddle we just shipped him! "Hi Terri, I got the saddle last Saturday, you were right pictures don't do it justice! My warmest thanks to you and bob, well done bob a nice piece of art and craftsmanship. The Best of it all is that now, not only me enjoying the ride but the girls also! I never seen them so happy and obedient during our rides. They can move without any pushing thanks to you and your team." Again the best deal I ever made, thanks I will give you a call tomorrow. We love the dramatic two-tone colors on chaps #247. Those oak leaves are stand outs! Chinks #426 went to Germany! Chinks #429 sure were pretty. We don't do many roughout chinks, but these will definitely look nice in the show ring! Out West Saddlery shared a live video. Terri received a lovely video testimonial from Easy Release Equine, about the transformative herb programs that she offers for horses around the country. Take a look at what Lisa has to say about how her consistent herb program has helped her horse! These beautiful two-toned chinks are made out of a heavy duty hide that would be ideal for ranch work and trail riding, but they are soft enough that they bend and flow nicely on the leg. One happy customer's testimonial on chinks #423! "This was my first time wearing my new chinks. My saddle is a slick seat, wade style without bucking rolls. The difference between cotton denim pants against a slick leather saddle and leather chinks and this saddle, was like night and day!! I sat more secure (and centered) on my saddle than ever before. In addition, never in my life would I have thought that chinks could make a saddle more comfortable - in my case anyway, they did! And when I’m more comfortable - my horse is more comfortable. Thank you again and HAPPY TRAILS!" Your smile maker for the week! Black and brown can't help but look beautiful and sophisticated together on any piece of fashion, but especially horse gear! With Celtic knots and peony flower tooling, these chinks are meaningful and unusual, and the antiqued horseshoe conchos and "spots" on the edges, give them that extra pop of cowgirl bling. Out West Saddlery is with Travis Slagowski and 3 others. The Out West Saddlery Family wishes you and your family a Very Merry Christmas and a Happy, Healthy & Prosperous New Year! Thank you all for your support and participation and we look forward to sharing with you in 2018! We will be closed Dec 22, 2017 - Jan 1, 2018 for the holidays and end of the year inventory count. We have a huge scarf selection, and this new scarf design "Country Bouquet" happened to match perfectly with this pretty pair of brown and turquoise chaps. This is one of our exclusive print scarves, and there are only a few more available before the material runs out. They come in 36" and 44" squares, and are $50 or $60 respectively. Below are pictures of chaps and chinks we made for clinician Mark Rashid to use personally that ended up being used in the movie Out Of The Wild! The character Chad wore the chinks (slit in the one side yoke is a knife holder) and character Sam Mitchell wore the chaps! We made a cool set of matching eagle and cross chaps and cuffs for a soldier in Afghanistan. Looking for an awesome last minute Christmas gift? We have beautiful certificates that you can buy for EITHER a fixed amount to be used towards anything in the shop OR 1/2 down on the base price of a specific item. This is perfect if you know your loved one wants a custom Out West Saddlery Item such as bucking rolls, chinks, chaps, a headstall, or a belt, but you want to let them design it themselves after Christmas so they can have exactly what they want! We will mail you these printed color certificates, filled out with your loved one's name and the amount or item it will be for, in a quality envelope. Call us at 970-264-2524 to order in time for Christmas! Mark Rashid's awesome movie "Out Of The Wild" that features the custom saddle Bob made for the movie has FINALLY been released after 4 long years of waiting!! We watched it streaming on Amazon. What a treat!! Such a beautiful story of redemption, healing of the soul with the help of a special mustang and strong woman, great message about how horses should be treated and modern cowboy life. We love the beginning message in the movie of "When The Body Is Beaten...It's The Spirit That Keeps The Soul Alive"
Bob Beecher (aka Clarence Beecher, the name of the saddle maker in the movie) made the featured saddle in the movie designed to look old from the late 1800's but fit today's horses. The design included Mark's vision of what the saddle should look like from the book Mark wrote that the movie is based on. See below the "back story" on the saddle for the movie. It was such a thrill to see the saddle on a big screen! Physical (DVD, etc): Walmart, Amazon, Ingram, AEC, Vobile, Baker & Taylor and Waxworks. One of the "characters" in both the novel and the movie is Henry's saddle. Like all of the film's characters, the saddle has what is known as a "back story" - a history of the pertinent things that have happened to the character that attribute to where the character is when the story begins. The saddle's story begins in the 1880's, when Henry's great grandfather, William, and his wife, Clare, immigrate to the U.S. from Ireland. Sheep herders in Ireland, the McBride's eventually find their way to Texas, where William takes a job as a cowboy at the Rocking Chair Ranch near Houston. There, he becomes friends with another cowboy and saddle maker, Clarence Beecher. Clarence builds William a working man's saddle, with very few adornments (as was custom in the day) with the exception of William's initials, which are carved into the back of the cantle (the back of the saddle's seat) and a celtic thistle flower, which is carved into the cap of the saddle horn. The celtic thistle is important to William in that it is his wife's favorite flower, and he wanted it on his saddle as a reminder of his wife while out on long cattle drives. In the movie, the saddle is now a family heirloom that has been handed down through generations and finally ended up with Henry. It is the only possession he owns that means anything to him, and which he doesn't want to live without. It is also a very rare saddle, as Clarence Beecher only made a handful of saddles during his life and due to the quality and workmanship he put into them, they have become highly collectable. Because of the specialness of the saddle, and it's importance to the overall story, a new saddle needed to be built specifically to fill the role. But the saddle also needed to look old and well used, along with special care given to make sure it would actually fit the horses' backs on which it would be used. The producers contacted expert saddle maker Bob Beecher, and his wife Terri, in Pagosa Springs, Colorado. Bob is a maker of fine, period-looking saddles, and after a brief discussion, Bob and Terri enthusiastically agreed to build this very special saddle for the movie. Men need them too! Muscle testing/kinesiology has proven hugging heart to heart not only shares love and comport it makes both parties energetically stronger! When we hug the traditional way right shoulder to right shoulder although love and comfort is still shared it weakens both parties energetically! These beauties were a real joy to make. They have a hand painted mahogany background behind the tooled pine cones, beautiful dusky blue accents to add a subtle pop of color, and gorgeous JM brass hardware to really finish off the look! Chocolate brown lightweight soft hide with turquoise accents, barbed wire stamping, and some pretty concho bling!